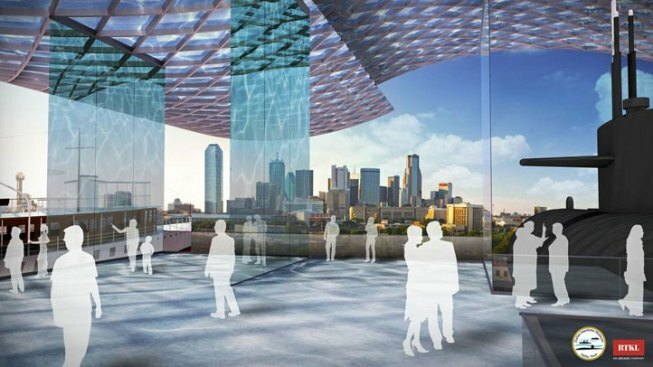 Artist renderings of the Dallas Maritime Museum. Dallas may be more than 250 miles from the Gulf of Mexico, the closest body of salt water, but that's not stopping a foundation and city officials from announcing plans for an $80 million maritime museum. In the 1990 thriller "The Hunt for Red October," Americans got to know the U.S.S. Dallas as one of the submarines on the big screen. But now North Texans will have a chance to see it in person, at a 3.5-acre museum in the Cedars neighborhood near downtown. "Plans are in the works for the U.S.S. Dallas—nuclear power submarine, our city's namesake vessel, to occupy the first berth," Rollie Stevens, president of the Dallas Maritime Museum Foundation said. The soon-to-be decommissioned submarine is part of the proposed Dallas Maritime Museum. Once built, the museum will feature a 30,000-square-foot facility, theater, and event plaza. Right next to the facilities there were be three spaces for the vessels. Eventually the replica of the Dallas that is currently on display will be replaced by the real submarine, which will be brought to the site in pieces and, once reassembled, will be more than 300 feet in length. touring the ship," Stevens said. For the city, besides the cultural benefits, there's the anticipated economic boost from tourists and locals that the Cedars neighborhood in the shadow of downtown will receive. "We need to be the city where families have fun; all coming together,” Dallas Mayor Mike Rawlings said. Museum officials anticipate it will open within the next three to four years.